Hemophagocytic lymphohistiocytosis is a rare and often fatal disease that may occur in solid organ transplant recipients. Here, we describe 2 patients who developed hemophagocytic lymphohistiocytosis after having a lung transplant and present a review of all cases of hemophagocytic lymphohistiocytosis occurring in solid organ transplant recipients. Diagnosis of hemophagocytic lymphohistiocytosis relies on the association of clinical findings and the presence of hemophagocytosis. Clinical presentation is nonspecific and patients may present with unexplained sepsis or multiple organ failure. Management consists of treating the underlying process; but unfortunately, the prognosis is poor. Diagnosis of HLH is one of exclusion, and recognition is frequently delayed because the condition mimics other, more-common diseases. Although HLH has been described previously as complicating liver and kidney transplant, to our knowledge, it has not been reported in association with lung transplant. Hemophagocytic lymphohistiocytosis is uncommon, and the clinician’s familiarity with its clinical features and diagnostic criteria is imperative for establishing a prompt diagnosis. It is in that context, that we present 2 patients who developed HLH after lung transplant. In addition, we summarize the available literature regarding HLH occurring after solid organ transplantation. A 27-year-old woman with cystic fibrosis presented to the hospital 5 months after having a bilateral lung transplant with altered mental status and fever. Her physical examination revealed lethargy, jaundice, and hepatosplenomegaly. Her admission laboratory work up revealed pancytopenia with a white blood cell count of 1.3 × 109/L, hemoglobin of 86 g/L, and platelet count of 109 × 109/L. Additional laboratory findings consisted of aspartate transaminase, 136 U/L; aspartate transaminase, 48 U/L; alkaline phosphatase, 711 U/L; gamma glutamyl transpeptidase, 354 U/L; total bilirubin, 259.9 µmol/L; conjugated bilirubin, 25 µmol/L; ammonia, 108 µmol/L; and lactate dehydrogenase, 653 U/L. Coagulation times were normal: activated partial thromboplastin time, 23 seconds; prothrombin time, 9.7 seconds; and international normalized ratio (for blood clotting time), 0.9. Clottable fibrinogen was 9.9 µmol/L. An abdominal ultrasound demonstrated sludge within the gallbladder, with mild gallbladder wall thickening, and poor visualizing of the spleen. Hepatitis serology including hepatitis B surface antigen and core IgM antibody, hepatitis C antibody, and hepatitis A IgM antibody were negative. Within days of admission, her mental status declined requiring initiation of mechanical ventilation. The patient remained febrile during her hospital course (> 7 days) and eventually became hemodynamically unstable and developed a shock state requiring multiple vasopressor agents. A magnetic resonance image of the brain (Figure 1) demonstrated areas of subcortical T2 signal abnormality involving the posterior temporal, parietal, and occipital lobes. Cerebral spinal fluid analysis revealed clear, colorless fluid with 2 red blood cells/µL and no white blood cell count, with an elevated glucose of 6.27 mmol/L, and protein of 6.2 g/L. Cerebral spinal fluid cultures, blood cultures, and urine cultures were negative for bacterial, acid-fast bacteria, fungal, and viral infections. Cerebral spinal fluid was also negative for Epstein-Barr virus DNA, enterovirus RNA, JC virus DNA, varicella-zoster virus DNA, West Nile virus DNA, and herpes simplex virus DNA. Further blood work-up included Epstein-Barr virus, parvovirus B19, herpes simplex virus, human herpesvirus 6, human herpesvirus 8, and cytomegalovirus, all negative by polymerase chain reaction analysis for DNA. An electroencephalogram was performed, finding multifocal and independent epileptiform discharges independently over both hemispheres with moderate bihemispheric slow-wave activity. A liver biopsy was done that revealed a hepatic parenchyma with normal lobular architecture and marked cholestasis with no evidence of fibrosis. Immunohistochemical stains were negative, and no viral inclusions or granulomas were present. Bacterial, viral, and fungal cultures on the liver tissue were negative. 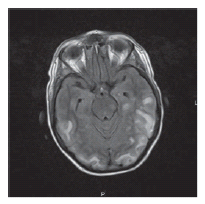 Approximately 2 weeks after hospitalization, a diagnosis of HLH was considered. Additional testing to rule out HLH included a ferritin level of 8893.6 pmol/L, and a triglyceride level of 2.75 mmol/L. Bone marrow biopsy demonstrated a hypocellular bone marrow with trilineage maturation; relative erythroid predominance, with no increase in blasts; and no evidence of infectious or malignant processes; however, the macrophages included hemosiderin-laden forms with increased hemophagocytosis (Figure 2). Bacterial, acid-fast bacteria, viral, and fungal cultures were all negative. The patient deteriorated, despite support with mechanical ventilation, and died as a result of multiorgan dysfunction approximately 30 days after admission. A 65-year-old woman with history of end-stage chronic obstructive pulmonary disease, presented to the hospital approximately 4 months after undergoing a single left lung transplant. The patient complained of intermittent symptoms of altered mental status, headache, tremors, low-grade fever, and weight loss over the course of several weeks. She underwent a bronchoscopy to rule out acute rejection (which was complicated with development of pneumothorax and respiratory failure). Biopsies showed no evidence of acute cellular rejection. A computed tomography of the chest showed no evidence of pneumonia or pleural effusions, and a computed tomography of the abdomen revealed the presence of splenomegaly. The patient was intubated and transferred to the intensive care unit, where she developed fever and shock within 48 hours of admission requiring supportive care with vasopressor agents and treatment with broad spectrum antibiotics. A diagnosis of septic shock was considered. Her admission laboratory work up revealed: white blood cell count, 6.8 × 109/L; hemoglobin, 91 g/L; and platelet count, 93 × 109 /L; aspartate transaminase, 70 U/L; aspartate transaminase, 50 U/L; alkaline phosphatase, 540 U/L; total bilirubin, 70.1 µmol/L; conjugated bilirubin, 59.8 µmol/L; lactate dehydrogenase, 570 U/L; and haptoglobin 1 µmol/L. The coagulation times were (all normal) as follows: activated partial thromboplastin time, 26 seconds; prothrombin time, 11 seconds; and international normalized ratio, 1.1. Clottable fibrinogen was 12.3 µmol/L. Antibodies for HLH syndrome were negative. Blood cultures for bacterial and fungal organisms were negative. Over the next 7 days, the patient developed pancytopenia and became less reactive to verbal or painful stimuli. A computed tomography of the brain showed new, bilateral, hypodense lesions involving the cerebral hemispheres, consistent with infarction. A further diagnostic work-up showed an Epstein-Barr virus DNA by polymerase chain reaction in peripheral blood of 5000 DNA copies/mL, and an elevated ferritin level of 2195.3 pmol/L. Additionally, a natural killer cell assay showed decreased natural killer cell function. Bone marrow biopsy demonstrated hypocellular bone marrow (trilineage hypoplasia) without evidence of hematolymphoid malignancy or hemophagocytosis. A diagnosis of secondary HLH was based on clinical and laboratory findings, and the patient was treated with intravenous acyclovir. Despite supportive therapy, the patient deteriorated and died approximately 1 month after hospital admission. Hemophagocytic lymphohistiocytosis, also known as hemophagocytic syndrome, is a rare, potentially life-threatening condition, characterized by hemophagocytosis presence in the bone marrow and other tissues, manifested clinically with multisystemic inflammation. Hemophagocytic lymphohistiocytosis was probably first described by Scott and Robb-Smith in 1939, as a syndrome characterized by fever, peripheral lymph node enlargement, pancytopenia, and histiocyte proliferation.8 Nevertheless, Farquhar and Claire are credited with the first report of HLH, which they named familial hemophagocytic reticulosis.1 The first series of transplant patients affected with HLH were described by Tisdall and associates, in 1979, who reported HLH associated with viral infections in 19 patients (including 13 kidney transplant recipients). Although the clinical features of HLH have been well described, the pathophysiology of the disease is not completely understood. Genetic studies in patients with primary HLH have revealed mutations that affect the intracellular trafficking and delivery to target cells of cytotoxic granules necessary for apoptosis. Mutations affecting perforin (a cytotoxic protein), Munk 13-4 (involved in granule exocytosis), and syntaxin 11 (involved in intracellular trafficking) have been described in association with familial HLH.2-4 In addition, genetic syndromes with a propensity of developing HLH include Griscelli syndrome, in which there are mutations of Rab27a (necessary for docking secretory granules at the cell membrane) and Chediak-Higashi syndrome, which is caused by mutations in the lysosomal trafficking regulator protein.5-6 In comparison, the pathophysiology of secondary HLH appears to be linked to certain triggering events that cause abnormal macrophage activation and T-cell proliferation. Secondary or reactive HLH may develop at any age, and frequently is associated with systemic infection (Table 1), immunodeficiency, malignancy, and inflammatory or autoimmune disorders. No underlying cause is identified in approximately 20% of the patients.5 To the best of our knowledge, these are the first reported cases of HLH occurring after a lung transplant. Both cases occurred within 6 months of the transplant. In our review of the literature, we found that HLH may develop as early as a few weeks after transplant, although the majority occurs several months after transplant (Table 2). No cause was found in the first case, and Epstein-Barr virus was implicated as the causative agent in the second one. Our review of the literature found 67 instances of reactive HLH reported after solid organ transplant: 60 in kidney transplant recipients, 5 instances in liver transplant recipients, and 2 instances in heart transplant recipients. 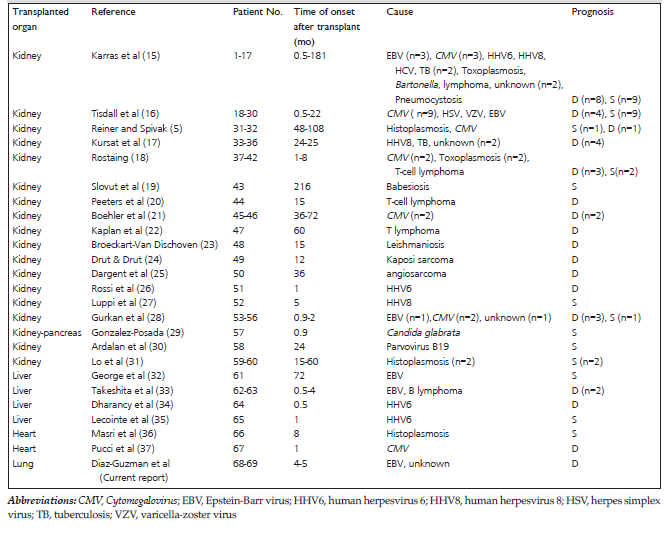 Most instances were associated with viral infection, among which cytomegalovirus appears the most-frequent causative pathogen (20 of 67 instances). Epstein-Barr virus infection accounted for only 7 cases, although it has been described as the most-common triggering agent in other series of patients with HLH.10 Human herpes viruses, including herpes simplex virus 5 and human herpesvirus 8, were also associated with 7 instances of HLH. The diagnosis of HLH is based on clinical and laboratory features, which are nonspecific and sometimes difficult to differentiate from underlying disorders or common causes of multiorgan inflammation, such as sepsis syndrome. Similarly, the 2 patients in this report presented with altered mental status, fever, and hepatosplenomegaly. Owing to the nonspecific nature of symptoms, diagnosis of HLH was not suspected until weeks after hospital admission. 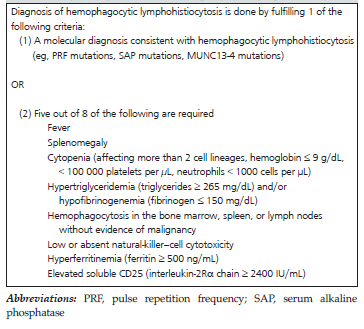 The criteria for establishing a diagnosis of HLH is shown in Table 3. With the discovery that defective natural killer cell function is integral to the development of HLH, demonstration of decreased natural killer cell activity (measurable by flow cytometry) has been added as a new diagnostic criterion, as has elevated serum soluble CD25 (IL-2 receptor, a reflection of hyper­tyrosinemia). Finally, a molecular genetic abnormality consistent with HLH (eg, perforin or Munc13-4 mutations) is considered diagnostic. In conclusion, HLH is an uncommon but potentially lethal complication that may develop in solid organ transplant patients, including lung transplant recipients. The diagnosis should be considered in patients that develop clinical features consistent with a sepsislike syndrome or multiple organ failure of unclear cause, which presents with the appropriate constellation of laboratory abnormalities. Bone marrow biopsy and natural killer cell activity testing should be obtained in such cases, and consultation with a hematology-oncology specialist should be considered. Treatment of HLH is complex and is dictated by the presence or absence of underlying conditions. Despite its treatment, the prognosis remains poor. Filipovich A, McClain K, Grom A. Histiocytic disorders: recent insights into pathophysiology and practical guidelines. Biol Blood Marrow Transplant. 2010;16(suppl 1):S82-S89. Feldmann J, Callebaut I, Raposo G, et al. Munc13-4 is essential for cytolytic granules fusion and is mutated in a form of familial hemophagocytic lymphohistiocytosis (FHL3). Cell. 2003;115(4):461-473. Stepp SE, Dufourcq-Lagelouse R, Le Deist F, et al. Perforin gene defects in familial hemophagocytic lymphohistiocytosis. Science. 1999;286(5446):1957-1959.
zur Stadt U, Schmidt S, Kasper B, et al. Linkage of familial hemophagocytic lymphohistiocytosis (FHL) type-4 to chromosome 6q24 and identification of mutations in syntaxin 11. Hum Mol Genet. 2005;14(6):827-834. Reiner AP, Spivak JL. Hematophagic histiocytosis. A report of 23 new patients and a review of the literature. Medicine (Baltimore). 1988;67(6):369-388. Henter JI, Horne A, Aricó M, et al. HLH-2004: Diagnostic and therapeutic guidelines for hemophagocytic lymphohistiocytosis. Pediatr Blood Cancer. 2007;48(2):124-131. Gupta A, Weitzman S, Abdelhaleem M. The role of hemophagocytosis in bone marrow aspirates in the diagnosis of hemophagocytic lymphohistiocytosis. Pediatr Blood Cancer. 2008;50(2):192-194. Scott RB, Robb-Smith AHT. Histiocytic medullary reticulosis. Lancet. 1939;ii:194-198. Farquhar JW, Claireaux AE. Familial haemophagocytic reticulosis. Arch Dis Child. 1952;27(136):519-525. Janka GE. Hemophagocytic syndromes. Blood Rev. 2007;21(5):245-253. Filipovich AH. Hemophagocytic lymphohistiocytosis and other hemophagocytic disorders. Immunol Allergy Clin North Am. 2008;28(2):293-313, viii. Goo HW, Weon YC. A spectrum of neuroradiological findings in children with haemophagocytic lymphohistiocytosis. Pediatr Radiol. 2007;37(11):1110-1117. Créput C, Galicier L, Buyse S, Azoulay E. Understanding organ dysfunction in hemophagocytic lymphohistiocytosis. Intensive Care Med. 2008;34(7):1177-1187. Imashuku S. Advances in the management of hemophagocytic lymphohistiocytosis. Int J Hematol. 2000;72(1):1-11. Karras A, Thervet E, Legendre C; Groupe Coopératif de transplantation d'Ile de France. Hemophagocytic syndrome in renal transplant recipients: report of 17 cases and review of literature. Transplantation. 2004;77(2):238-243. Tisdall RJ, McKenna RW, Nesbit ME, et al. Virus-associated hemophagocytic syndrome: a benign histiocytic proliferation distinct from malignant histiocytosis. Cancer. 1979;44(3):993-1002. Kursat S, Cagirgan S, Ok E, et al. Haemophagocytic-histiocytic syndrome in renal transplantation. Nephrol Dial Transplant. 1997;12(5):1058-1060. Rostaing L, Fillola G, Baron E, Cisterne JM, Durand D. Course of hemophagocytic histiocytic syndrome in renal transplant patients. Transplantation. 1995;60(5):506-509. Slovut DP, Benedetti E, Matas AJ. Babesiosis and hemophagocytic syndrome in an asplenic renal transplant recipient. Transplantation. 1996;62(4):537-539. Peeters P, Sennesael J, De Raeve H, De Waele M, Verbeelen D. Hemophagocytic syndrome and T-cell lymphoma after kidney transplantation: a case report. Transpl Int. 1997;10(6):471-474. Boehler A, Schaffner A, Salomon F, Keusch G. Cytomegalovirus disease of late onset following renal transplantation: a potentially fatal entity. Scand J Infect Dis. 1994;26(4):369-373. Kaplan MA, Ferry JA, Harris NL, Jacobson JO. Clonal analysis of posttransplant lymphoproliferative disorders, using both episomal Epstein-Barr virus and immunoglobulin genes as markers. Am J Clin Pathol. 1994;101(5):590-596. Broeckaert-van Orshoven A, Michielsen P, Vandepitte J. Fatal leishmaniasis in renal-transplant patient. Lancet. 1979;2(8145):740-741. Drut R, Drut RM. EBV-associated Kaposi's sarcoma in a pediatric renal transplant recipient. Pediatr Pathol. 1994;14(5):863-872. Dargent JL, Vermylen P, Abramowicz D, et al. Disseminated angiosarcoma presenting as a hemophagocytic syndrome in a renal allograft recipient. Transpl Int. 1997;10(1):61-64. Rossi C, Delforge ML, Jacobs F, et al. Fatal primary infection due to human herpesvirus 6 variant A in a renal transplant recipient. Transplantation. 2001;71(2):288-292. Luppi M, Barozzi P, Rasini V, et al. Severe pancytopenia and hemophagocytosis after HHV-8 primary infection in a renal transplant patient successfully treated with foscarnet. Transplantation. 2002;74(1):131-132. Gurkan A, Yakupoglu U, Yavuz A, et al. Hemophagocytic syndrome in kidney transplant recipients: report of four cases from a single center. Acta Haematol. 2006;116(2):108-113. González-Posada JM, Hernández D, Martin A, et al. Hemophagocytic lymphohistiocytosis in a pancreas-kidney transplant recipient: response to dexamethasone and cyclosporine. Clin Nephrol. 2008;70(1):82-86. Ardalan MR, Shoja MM, Tubbs RS, Esmaili H, Keyvani H. Postrenal transplant hemophagocytic lymphohistiocytosis and thrombotic microangiopathy associated with parvovirus b19 infection. Am J Transplant. 2008;8(6):1340-1344. Lo MM, Mo JQ, Dixon BP, Czech KA. Disseminated histoplasmosis associated with hemophagocytic lymphohistiocytosis in kidney transplant recipients. Am J Transplant. 2010;10(3):687-691. George TI, Jeng M, Berquist W, Cherry AM, Link MP, Arber DA. Epstein-Barr virus-associated peripheral T-cell lymphoma and hemophagocytic syndrome arising after liver transplantation: case report and review of the literature. Pediatr Blood Cancer. 2005;44(3):270-276. Takeshita M, Kikuchi M, Ohshima K, et al. 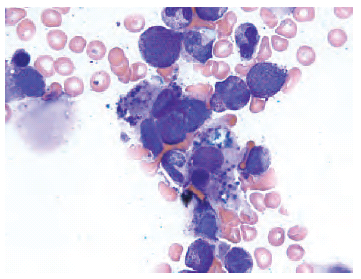 Bone marrow findings in malignant histiocytosis and/or malignant lymphoma with concurrent hemophagocytic syndrome. Leuk Lymphoma. 1993;12(1-2):79-89. Dharancy S, Crombe V, Copin MC, et al. Fatal hemophagocytic syndrome related to human herpesvirus-6 reinfection following liver transplantation: a case report. Transplant Proc. 2008;40(10):3791-3793. Lecointe D, Fabre M, Habes D, Mielot F, Bernard O, Nordmann P. Macrophage activation syndrome in primary human herpes virus-6 infection: a rare condition after liver transplantation in infants [in French]. Gastroenterol Clin Biol. 2000;24(12):1227-1228. Masri K, Mahon N, Rosario A, et al. Reactive hemophagocytic syndrome associated with disseminated histoplasmosis in a heart transplant recipient. J Heart Lung Transplant. 2003;22(4):487-491. Pucci A, Grasso M, Arbustini E. Myocardial involvement due to a disseminated human cytomegalovirus infection in a heart transplant recipient. A case report. G Ital Cardiol. 1989;19(3):230-233. Acknowledgements: There was no funding source needed for this manuscript. The authors have no significant conflicts of interest with any companies or organizations whose products or services may be discussed in this article. Figure 1. Subcortical T2 signal abnormality involving the posterior temporal, parietal and occipital lobes. Figure 2. Bone marrow aspirate (1000 × oil) showing 2 hemophagocytic histiocytes. The solid arrow indicates an engulfed mature red blood cell; the dashed arrow shows a degenerating phagocytosed nucleus. Table 1. 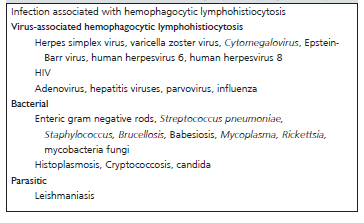 Infections associated with hemophagocytic lymphohistiocytosis. Table 2. Diagnostic guidelines for hemophagocytic lymphohistiocytosis. Table 3. Reported cases of hemophagocytic lymphohistiocytosis in solid organ transplant recipients.